Despite a reputation as lovable losers, Columbia Football is now a juggernaut in the Ivy League, finishing the 2017 season with a formidable 8-2 record. 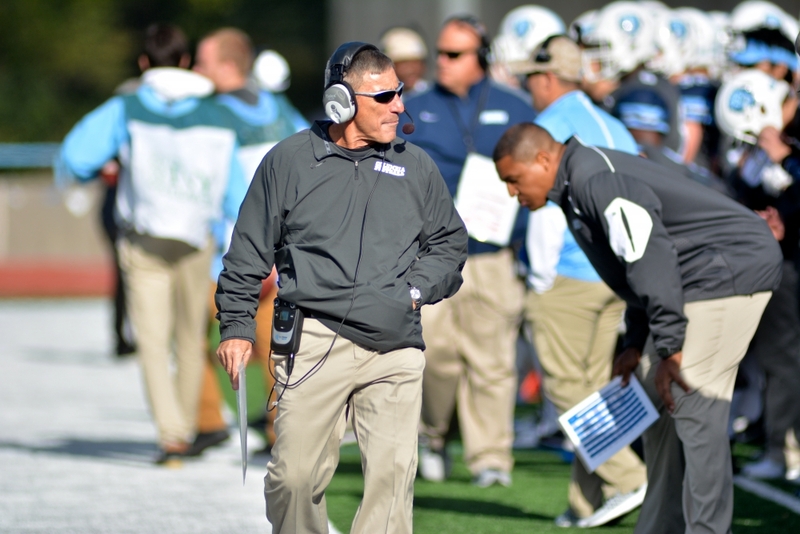 It’s clear that Columbia head Coach Al “Big Daddy” Bagnoli, who formerly coached the Penn Quakers for over 20 years, is making big changes to the Lions football program. We interviewed several players to gain some key insights into the new culture Coach Bagnoli is cultivating both on and off the field. FED: To what do you credit your team’s newfound success? How has Coach Bagnoli cultivated this success in a previously unsuccessful team? Mixon: Coach always tells us that the most important thing is mentality. We used to go onto the field every week expecting to lose. If you keep expecting to lose, you’re gonna keep losing. But Coach kept telling us, ‘Guys, you’re a damn talented group, and I know you can win games. You gotta stay focused on winning! Because if you keep losing, you’re gonna know the sting inside my spanking tent.’ That really stuck with me, and got me convinced that I can win. There’s no motivator like the spanking tent. FED: As a senior member of the team, you were here before Coach Bagnoli arrived. What have been some of the bigger changes during his tenure? Dugnutt: I think Coach Bagnoli put a lot of pressure on the administration to provide more resources for players now: new training staff, new nutritionists, a new medical tent right on the field, a new, smaller tent right next to that one where Coach takes us if we’ve been bad. Between the workouts, nutrition, medical staff, and spanking tent, it’s a whole new team! FED: We’ve been hearing a lot about something called “Coach Bagnoli’s Spanking Tent”. What exactly is that? Dustice: The spanking tent is the beginning and the end. It’s where I start my days and end my nights. To you it might just look like any other tent. But I know the black leather interior, as dark as the night sky; I know how the wind howls through its inky flaps, tearing at my uniform and filling my heart with fear. There’s no escape, even in sleep. I visit it in my dreams. It’s much bigger on the inside than on the outside. Let me put it this way: there are only two things that I can feel anymore: the thrill of victory, and the sting of Coach’s paddle. And dear God, you don’t know what it was like after we lost to Yale. Editor’s note: No members of the 1992-2014 Penn Football teams could be reached for comment, as most of their information has been expunged from the public record. The University of Pennsylvania refused to return our calls.